The public works team performs a variety of functions including but not limited to the following, maintaining the water treatment and distribution system to ensure clean and safe water, maintaining the wastewater treatment and collection system to ensure the wastewater is handled properly, maintains the roads and storm drain system to ensure proper operation for the city, maintains all the city buildings and all other duties as needed to ensure the residents have a clean and safe town to call home and visitors have a joyful time while in our community. 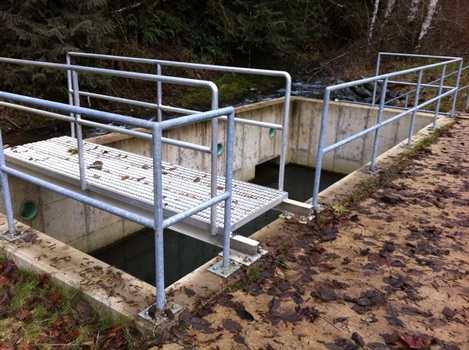 The City of Yamhill has finished and operated the new wastewater headwork's for a year now. The new structure and equipment are working as expected and should last the city of the next 20 years. This piece of equipment separates the material flushed down the waste stream that will not breakdown or decompose in the lagoon treatment system. We are very happy with the way this structure is working. The City of Yamhill started pursuing a new intake structure in 2006. This was due to the hillside at the existing dam site sliding into the creek. After an investigation it was discovered that the hillside had been sliding for several years. This with the requirement of fish and wildlife to construct a new fish ladder started the process of the new intake. It took 4 years of planning to determine the best site and design for the city's long term needs. During that process we also discovered that a portion of the cities water rights were never finalize by the state and we had to finish that process. The estimated cost for the total project structure, permits, moving the point of diversion and finalizing the paperwork was $500,000 to $600,000. The City was able to secure grants to cover 75% of those cost for a city portion of approximately $125,000 to $150,000. The new structure was completed in the spring of 2012 and is working very well. The old dam and fish ladder were removed in the summer of 2013. This new structure will last the city for the next 20 plus years and allow for unobstructed fish passage up Turner Creek. The new restrooms were opened in June and are working as expected. The bathrooms are equipped with alarms, automatic locks and cameras to ensure that any vandalism will be recorded. The auto locks allow for better operations and keeping the restrooms open longer during the day. 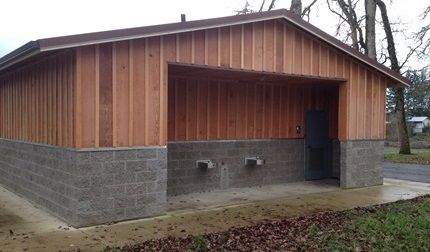 The estimated cost of this restroom facility was $280,000 to $300,000 dollars. The total cost at this point is approximately $175,000.